As far as breakfast is concerned, nothing, in my opinion, beats a good Omelette. There are really endless options available for making a good filling. 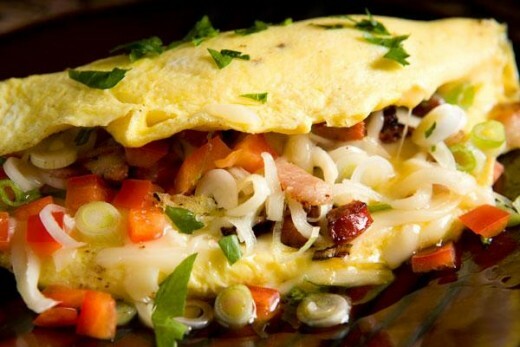 This page will explore some of the best and unique items to put into an omelette and take a look at what is on the breakfast menu at some of the finer dining establishments. HOP restaurants have a wide variety of omelettes on their menu. The create your own omelette caught my eye as I have been to several breakfast buffets where the chef will custom make an omelette in front of you using the ingredients of your choice. IHOP's choice of omelette fillings is rather limited with bacon, ham, pork sausage, mushrooms, green peppers, onions, cheese, tomatoes and spinach being the only choices. After looking at quite a few restaurant menus, I created the list below to help you and me get more creative with our omelettes. Vegetable Supreme Omelette - Green peppers, green onion, tomatoes, black olives and your choice of cheese. Pesto Omelette - Pesto, fresh tomatoes and mozzarella cheese. Mediterranean Omelette - Mozzarella & feta cheeses, tomatoes, fresh spinach, black olives and onions. California Omelette - Bacon, avocado and cream cheese. Greek Omelette - Tomato, feta cheese and spinach. The Engineer Omelette - Ham, Onion, Swiss cheese & tomato. The Hollywood Omelette - Hamburger, tomato, avocado & American cheese. The Florentine Omelette - Bacon, spinach & mozzarella cheese topped with marinara sauce and Parmesan cheese. The Turkey Club Omelette - Turkey, avocado, tomato and cream cheese. The Southern Omelette - Bacon, sausage and tomato with sausage gravy. The Philly Omelette - Sliced beef, mushrooms, onions and mozzarella cheese. Mexican Chicken Omelette - Chicken, red and green peppers, tomatoes, onions, cheddar cheese topped with salsa and sour cream. Do not use cracked eggs because they may contain bacteria. The secret to cooking eggs is to be gentle and apply low heat. If eggs cook too fast or too long, they come out rubbery. The maximum load for a successful omelette is three eggs. Use 1 Tbsp of water for each egg. Water is used because it slows down the cooking and makes the texture of the omelette lighter and fluffier. So use these tips and filling choices to make a great restaurant quality omelette at home in your kitchen. Looking for more omelette inspiration? Visit every last recipe for the internet's largest recipe index. Copycat Recipes from your favorite pancake restaurant.